What would happen if a "big one" ... we're talking magnitude 7.7... hit the New Madrid Seismic Zone? The Federal Emergency Management Administration (FEMA), with the Mid-America Earthquake (MAE) Center at University of Illinois, released a report in 2008. Phase two of the report was released in June 2010 which looked at results of a complete rupture of the entire New Madrid fault, where phase one looked at possibilities if various segments erupted. Phase two comes up with $300 billion in direct economic loss. That's three times the worst case of phase one figures. Other phase two figures: Nearly 715,000 damaged buildings, 2.6 million households without electric power, nearly 86,000 total casualties with 3,500 fatalities for the 2 a.m. scenario event. How much highway/bridge damage? How will people get medicine refills when the doctor and pharmacy records may not be available, and transportation/distribution is in chaos? What's the legality of "good samaritan" medical people coming from a different state to help? Illinois' 40 critical counties have 1.3 million total population. 51,000 would be displaced, and 15,000 would be seeking shelter. Even one magnitude 7.7 quake in the Midwest would have significant implications for the entire country for years. Please read the (phase 1) report, at http://hdl.handle.net/2142/8971 The main report is a 2 megabyte download. The full report is 74 meg. They've divided the New Madrid zone into THREE PARTS, and estimated a different fault rupture for each state; sort of a "worst case scenario". Remember that a "big one" on the NMSZ would likely be a series of quakes, over a few months, on different sections of the fault. There are actually about seven sections to the NMSZ. The maps below show areas of probable worst building damage. The scenario is DIFFERENT for each state's possible damage. Don't "add them together." These maps show "worst case" estimates for EACH STATE, individually. State of Kentucky emergency management folks think the West Kentucky risk calculated by others is overblown, based too much on California calculations. This Tenn. map doesn't look bad, considering Memphis might be significantly hit. Please read the full report. The bedrock in downtown St. Louis is 10 feet below the surface. The bedrock below Memphis is 3,000 feet down. Again: the scenario shown for each state is DIFFERENT, and should not be "added together" among states. The New Madrid Seismic Zone (NMSZ) involves eight states: Alabama, Arkansas, Illinois, Indiana, Kentucky, Mississippi, Missouri and Tennessee. 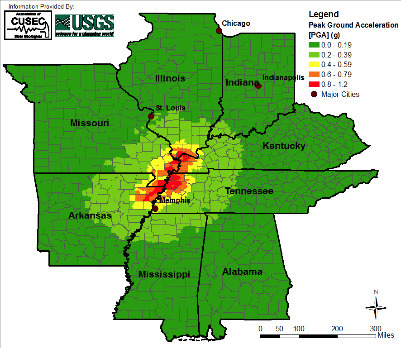 The Wabash Valley Seismic Zone (WVSZ) in southern Illinois and southeast Indiana and the East Tennessee Seismic Zone in eastern Tennessee and northeastern Alabama constitute significant risk of moderate-to-severe earthquakes throughout the central region of the USA. The State of Missouri also incurs substantial damage and loss, though estimates are less than those in Tennessee. Well over 80,000 buildings are damaged leaving more than 120,000 people displaced and causing over 15,000 casualties. Total direct economic losses in Missouri reach nearly $40 billion. Kentucky and Illinois also incur significant losses with total direct economic losses reaching approximately $45 and $35 billion, respectively. The State of Arkansas incurs nearly $19 billion in direct economic loss while the State of Mississippi incurs $9.5 billion in direct economic losses. States such as Indiana and Alabama experience limited damage and loss from NMSZ events with approximately $1.5 and $1.0 billion, respectively. Noting that experience confirms that the indirect economic loss due to business interpretation and loss of market share, amongst other features, is at least as high if not much higher than the direct economic losses, the total economic impact of a series of NMSZ earthquakes is likely to constitute by far the highest economic loss due to a natural disaster in the USA. Social losses and economic impacts for each state should not be combined. Since each scenario is based on a different hazard, adding impacts together will not reflect one regional scenario. A southwest NMSZ event affects the major population center of Memphis, TN, and leaves nearly 265,000 people displaced and over 63,000 people injured or killed. A southwest segment event could leave up to 500,000 people without homes and could injure 150,000 people across the entire NMSZ area. Up to 100,000 people may need temporary public shelter, which would require several million MREs (meals ready to eat) for the first week alone. In addition, over one million gallons of water and as many as ten million pounds of ice may be needed for a NMSZ event. Substantial losses in Tennessee, Kentucky, Arkansas, northwestern Mississippi and southeastern Missouri would likely generate over $100 billion in direct economic losses. A large portion of these losses would be due to utility lifeline losses with building losses contributing a significant portion as well. A northeast segment event, however, would impact southern Illinois as well as parts of Missouri and Kentucky. Economic losses caused by a northeast segment effect, while likely to be less than a southwest segment event, would result in total losses possibly reaching $75 billion in direct economic losses. Critical infrastructure and lifelines will also be heavily damaged and will be out of service after the earthquake for a considerable period of time. Such mass outages are likely to affect a region much larger than the 8 states studied above. Many hospitals nearest to the rupture zone will not be able to care for patients, indicating that those injured during the event will have to be transported outside of the region for medical care. Moreover, pre-earthquake patients will have to be moved out of the area to fully functioning hospitals. It is doubtful that the transportation system will be functioning to a level that allows such mass evacuation. Police and fire services will be severely impaired due to damage to stations throughout the impacted region. Many schools that serve as public shelter will be damaged and unusable after the earthquake. You ask how much, how soon? Graphic below comes from engineer Greg Hempen, St. Louis. Consider what he believes happened in three eras on three segments of the fault. Nov. 21, 2008 (Bloomberg) -- A major Midwestern earthquake may cause 6,000 deaths and $450 billion in damage, while disrupting oil and gas supplies, a U.S. government-sponsored study said. 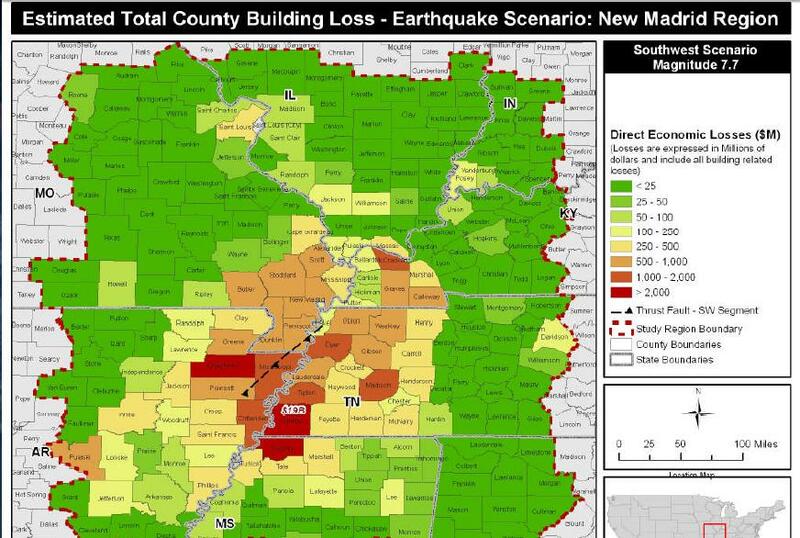 Tennessee and Missouri would suffer the brunt of the destruction from a 7.7-magnitude earthquake along the New Madrid Seismic Zone, where more than 3,000 temblors have occurred since 1974, according to the report from the Urbana, Illinois-based Mid-America Earthquake Center. A quake of about that force devastated the region almost 200 years ago, according to the U.S. Geological Survey. “All those who worked on this project already feel this would be the worst natural disaster in the history of the U.S.,” said Amr Elnashai, principal investigator and a civil engineering professor at the University of Illinois Urbana- Champaign, by telephone. There is a 90 percent chance that an earthquake of magnitude 6 or 7 will strike the area in the next 50 years, said the study, which was released yesterday. Eight states in the Midwest and South are vulnerable to major earthquakes, including Mississippi, Alabama and Indiana, according to the study, which was funded by the Federal Emergency Management Agency and the Army Corps of Engineers. The New Madrid zone runs from southern Illinois to northern Arkansas and includes Memphis, with a population of about 670,900, according to U.S. Census Bureau estimates. There is a 90 percent chance that an earthquake of magnitude 6 or 7 will strike the area in the next 50 years, the study says. Elnashai said earthquakes of equal magnitude would be felt over a larger area in the New Madrid zone than in California because of the composition of the soil. Many buildings in the area couldn't withstand the force of such an earthquake, Elnashai said. While some of the major bridges over the Mississippi and other rivers might hold up, they would still sink into the ground when it liquefied after the tremor. There are 15 nuclear power plants in the regions covered by the study, Elnashai said. Hospitals closest to the epicenter would be unusable, meaning the injured would have to be taken to neighboring states if they could be evacuated, the report said. Bridges, airports and ferries would be damaged and pipelines and electric transmission grids knocked out. “Damage to major natural gas and oil transmission lines will lead to service interruptions that will affect areas as far away as the East Coast and New England,” the report said. The outlook for Missouri and Illinois is grim should a catastrophic earthquake erupt on their segment of the New Madrid seismic zone, according to a new report released to the public late last week that's part of a broader federal emergency planning initiative. The study, backed by the Federal Emergency Management Agency, predicts casualties and damage to homes, hospitals, roads and utilities in six states should a magnitude-7.7 earthquake erupt along the New Madrid seismic zone. Two other seismic zones, which could affect Alabama and Indiana, were also studied. Conducted by the Mid-America Earthquake Center at the University of Illinois at Urbana-Champaign, the two-year study paints a dire picture for Missouri should a large temblor strike on the central segment of the fault. Among the predictions: 760 fatalities, $37 billion in total economic loss, 879 severely damaged bridges, 80,000 damaged buildings, 15,837 wastewater pipeline breaks and 121,927 displaced residents. In Illinois, 276 fatalities and a $31 billion economic loss are projected as well as 242 severely damaged bridges, 48,140 damaged buildings, 4,147 wastewater pipeline breaks and 51,381 displaced residents. Still, those numbers are lower than predictions for Tennessee. An estimated 2,904 people could die and a total economic loss of $56 billion could be incurred should a catastrophic earthquake strike on its segment of the fault. The study is part of FEMA's national initiative aimed at developing catastrophic earthquake disaster plans in eight Midwestern states. The initiative aims to identify high-risk areas and possible disaster planning shortfalls. "This initiative has its roots in Hurricane Katrina," said Mary Margaret Walker, a FEMA spokeswoman. "Since then, we've wanted to take a look at the disaster planning going on across the country. This study has a very specific use in that planning process." The study provided the basis for planning scenarios used in about 30 FEMA-sponsored workshops conducted this year. A second round of workshops are planned next year, focusing on regional impacts of a catastrophic earthquake. The New Madrid Fault, running from northeast Arkansas through Missouri's Bootheel into Southern Illinois, is considered one of the most dangerous earthquake zones in the United States. In 1811 and 1812, it let loose with three major quakes that have been estimated to register magnitude 7.5 to 8. The U.S. Geological Survey projects a 7 to 10 percent chance of an equally strong quake within the next 50 years, and a 25 to 40 percent chance of one of at least magnitude 6. The new study builds upon similar work conducted by the Memphis-based Central United States Earthquake Consortium several years ago. In general, that study predicted fewer casualties and a lesser impact on homes, utilities and the number of people needing shelter in most of the New Madrid states. Jim Wilkinson, the consortium's director, said the Mid-America study is now the new benchmark for federal emergency responders but predicted some of the scenarios will change as earthquake science continues to evolve. "I think there's a tendency to look at these kind of studies and see the numbers as absolute," Wilkinson said. "But there's not a model out there that can exactly predict what would happen in the event of a catastrophic earthquake. It's all a guess. Still, you've got to have something to build emergency plans on and that's how these kind of studies are helpful." In Missouri, the new study is not likely to alter any current state or local earthquake disaster plans, said Steve Besemer, the state Emergency Management Agency's earthquake program director. "Anytime you get any credible information like this, it's certainly worthwhile to review," Besemer said. "But it's driving FEMA planning more than us." Earlier this year, Besemer met with 47 county emergency management directors to discuss earthquake plans, and next month, he will meet with officials in the remaining counties in a series of regional meetings. Susie Stonner, a SEMA spokeswoman, said county emergency responders know that if they are prepared for the worst-case scenarios like those outlined in the new study, they will be prepared for more likely earthquake events like the magnitude-5.2 quake that rattled St. Louis in April. "They know they're sitting on top of a powder keg," Stonner said. "They're very serious about emergency planning."